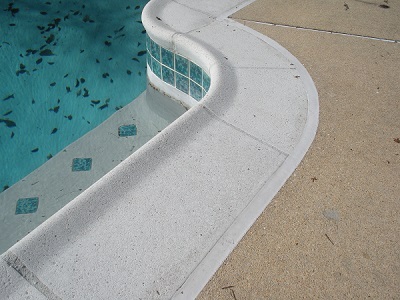 Our caulk jobs are flush with the deck and coping with no spillovers. 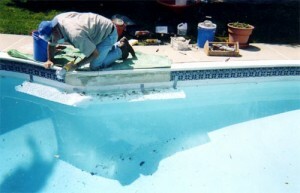 Flush caulking prevents algae and plant growth in the coping joint. 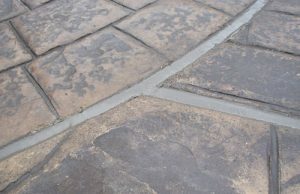 A good caulk job will prevent frost penetration to help protect tile and coping damage. 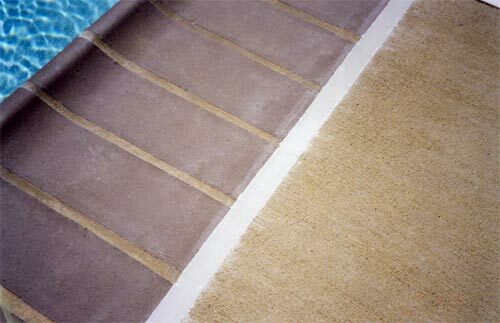 We use two part gun-grade polyurethane caulk. 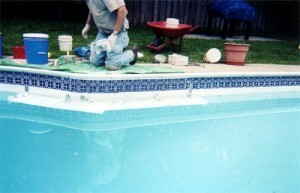 We do not use pourable or self leveling caulk. 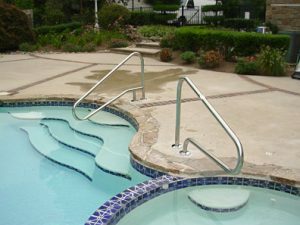 Two Part Gun-grade polyurethane is stiffer and more labor intensive, but it has many advantages. I wanted to thank you for your excellent work over the past few years. It’s been a pleasure working with you. – – – T.R. 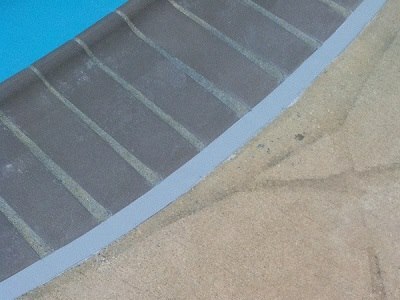 If your deck sinks below the coping, we can apply the caulk at a 45 degree angle to make a smoother transition. It will still look good. 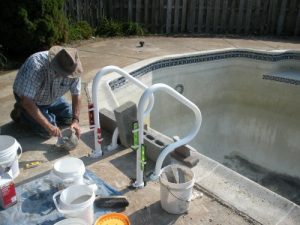 Pourable or Self leveling caulk will not give you the above advantages. 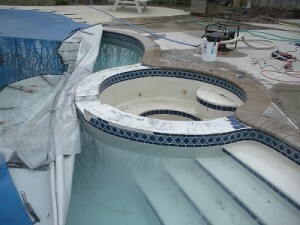 This is an older caulk job but it still looks great. 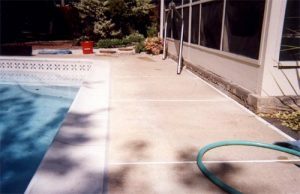 Ideal conditions: Sloping deck for good water run off, drain pipe on opposite side to prevent water from running under the deck, thus causing deck movement during frost. 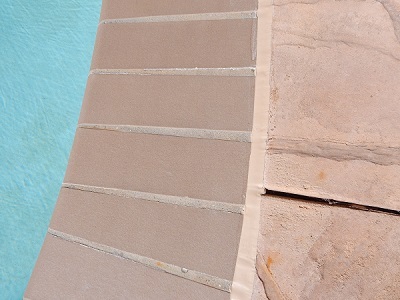 Out door deck at a local restaurant with matching color and caulk below grade to match the pattern in the deck. We offer a wide variety of colors. The most popular are White, Gray and Tan. 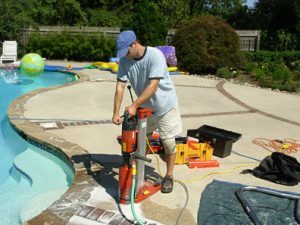 Core drilling for handrail anchors. Anchors will be bonded and installed with hydraulic cement. 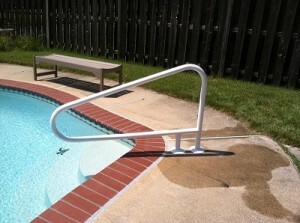 Finished handrail installation at right. 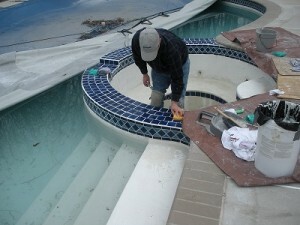 Contact us for service in New Castle County, Delaware or Chester County, PA or Cecil County, MD. 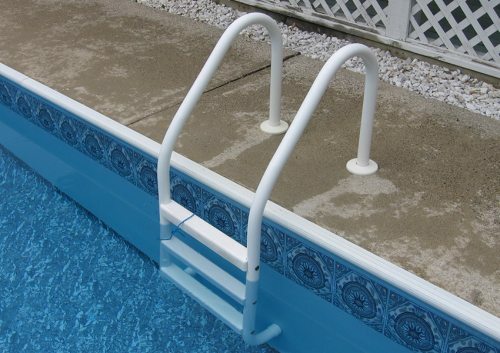 We also install Saftron heavy duty PVC handrails and grab rails in various colors. 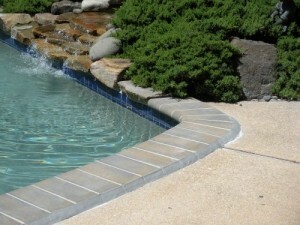 They do not require any bonding or grounding.